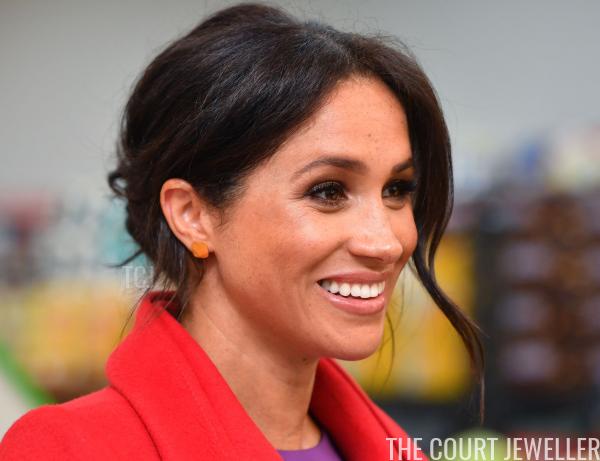 On Monday, the Duke and Duchess of Sussex made an official visit to Birkenhead, and Meghan wore gleaming gold jewels to coordinate with her cheerful, colorful ensemble. 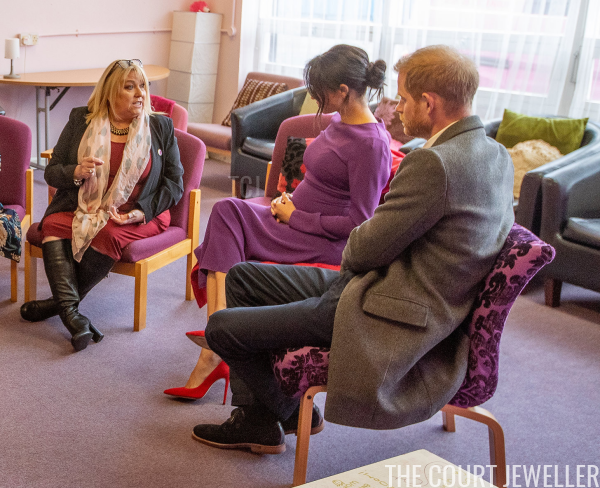 The couple made a series of stops during the visit, including the official opening of Number 7, a Feeding Birkenhead citizens supermarket and community cafe, part of an initiative aimed at working together to eliminate hunger in Birkenhead. Other engagements during the trip to Merseyside included a stop at the Tomorrow's Women Wirral Charity in Birkenhead. 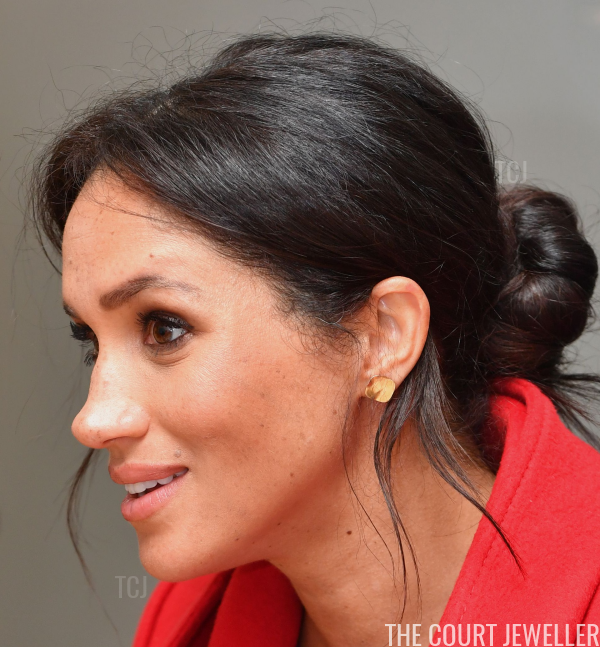 Meghan chose a simple, modern pair of stud earrings for the visit, made of gleaming yellow gold. 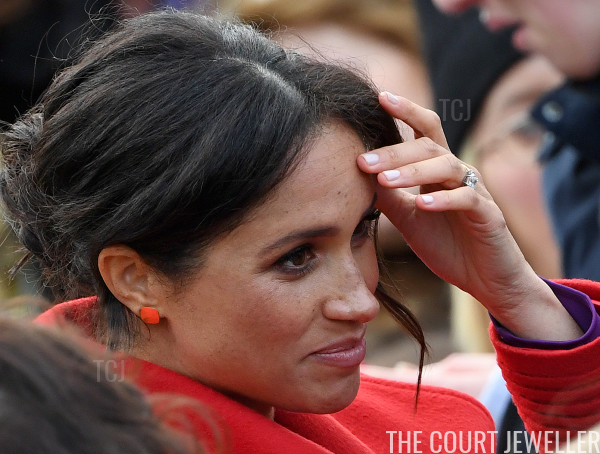 The shiny surface of the earrings reflected the colors of her surroundings, including the cherry hue of her vibrant red coat. In this shot, that reflection made the earrings appear to be orange-yellow. 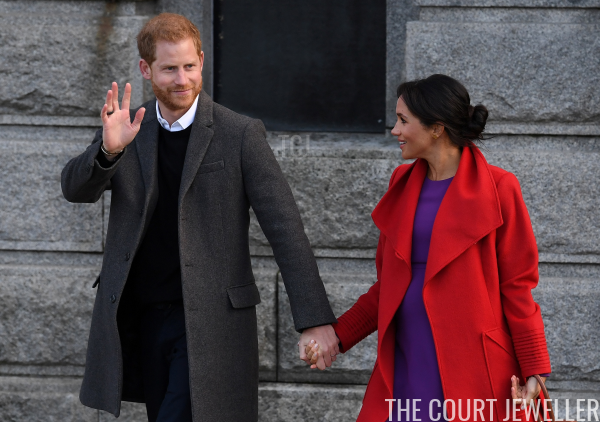 And here, as she and Harry greeted wellwishers during a walkabout, the combination of the natural lighting and the reflection of the coat made the earrings appear to be red. 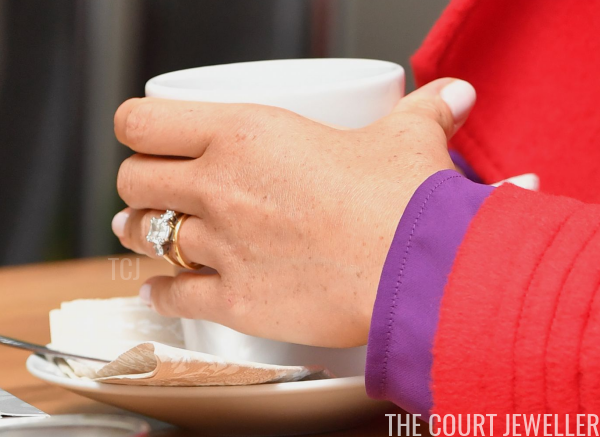 Meghan sensibly let the bright colors of her ensemble take center stage during the visit, keeping the rest of her accessories minimal: just her sparkling engagement and wedding rings, as well as another gold ring with a crescent moon motif on her other hand.